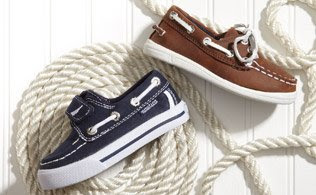 Nautica is synonymous with all-American style, and this smart collection of shoes for little boys showcases the brand's sporty aesthetic perfectly. Classic styles like boat shoes are both preppy and fun, while chukkas and oxfords come in tan, navy and more. With quality leather and durable souls, these shoes will have your little guy loving summer in comfort.